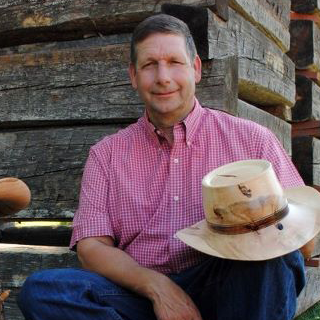 Jerry Measimer of Richfield, NC is a man of many hats. Literally. A master woodworker, he turns massive blocks of wood into exquisite urns and bowls, pens, guitars, toys and most notably, his signature custom-fitting hats pared down to a mere eight-inch thickness. Jerry’s hats have hung in fine art museums, been donned by a former Miss America, and worn by country music legends like Charlie Daniels. Not bad for a man who started woodturning just six years ago. A drywall and tile specialist by trade, Jerry equally deserves the title Renaissance man with layers of character that unfold the moment you meet him. He’s a charmer, an artisan, a teacher, a former marine, a father and grandfather, a philosopher, an engineer, a storyteller, a romantic, a humanitarian and the luckiest man you’ll ever find.